Song is “We Will Hang For This” by Glass & Ashes. They appear courtesy of No Idea Records. YoYo used is the Die-Nasty, by YoYo Factory. This is a nifty little repeater that I cooked up the other night, and I got Drew Tetz to be the yo-yo equivalent of my hype man for the trick filming. Additional background hype by Darnell Hairston. Song is “Time and a Half” by Less Than Jake. They appear courtesy of No Idea Records. That first little loop thrown straight from a 1.5 mount is from my buddy Rodrigo Yokota, a.k.a. “Whip”. The rest is just me looking for ways to make things unnecessarily difficult. Song is “Plastic Astronaut” by Strikeforce Diablo. They appear courtesy of No Idea Records. Song is “I Want My Coffee Like My Metal” by New Wave Blasphemy. They appear courtesy of No Idea Records and BEELZEBUB, THE DARK LORD OF THE HOARY DEPTHS. This is what I was trying to hit yesterday. It’s a long was from smooth and consistent, but it’s still pretty awesome. Song is “Hideaway” by Small Brown Bike. They appear courtesy of No Idea Records. Song is “Unemployed” by Dillinger Four. They appear courtesy of No Idea Records. Continuing yesterday’s theme of making things unnecessarily difficult just because I can, here’s a suicide to cross-armed Trapeze & His Brother, interrupted with a grind on the back of my throwing hand. I love this trick. Feels good, and when you slow it down it looks amazing. Song is “Dove” by Floor. They appear courtesy of No Idea Records. One of my favorite things about watching skating are those super brief little bits that happen so incredibly quickly, and yet you know if they’d been off or slower by just a hair they would have completely wiped out. For a while, I got really in to building tricks around the most subtle of elements….a grind that lasts just a second or two. But it makes a HUGE difference in being able to hit a suicide when you try and throw a grind in the middle of it, however brief. It’s a nice reminder that it’s the little things that matter. Song is “Ch1-Ch2” by Deadsure. They appear courtesy of No Idea Records. When I first started messing with this trick last week I had no idea where it was going. It started off really awkward. I kept at it, smoothed it out, and came up with an interesting trick that I think works out fairly well and has lots of potential. Song is “Colditz” by Die Hoffnung. They appear courtesy of No Idea Records. 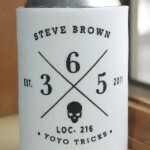 by 365YoYoTricks on February 09, 2011 in Featured with Comments Off on Koozie – Available Now!